• Is the fuel empty? • Is the fuel tank cap loose? your Toyota dealer as soon as possible. 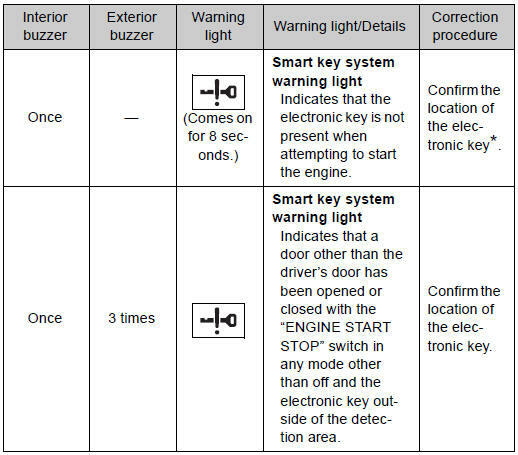 The buzzer indicates that the key has not been removed with the engine off and the driver’s door opened. The buzzer indicates that the moon roof is not fully closed with the engine off and the driver’s door opened. • If luggage is placed on the front passenger seat, the front passenger detection sensor may cause the warning light to flash, even if a passenger is not sitting in the seat. • If a cushion is placed on the seat, the sensor may not detect a passenger, and the warning light may not operate properly. When the battery charge becomes insufficient or the voltage temporarily drops, the electric power steering system warning light may come on. This warning light system monitors the airbag sensor assembly, front airbag sensors, side and curtain shield airbag sensors, curtain shield airbag sensors, driver’s seat position sensor, driver’s seat belt buckle switch, front passenger occupant classification system (ECU and sensors), “AIR BAG ON” indicator light, “AIR BAG OFF” indicator light, front passenger’s seat belt buckle switch, seat belt pretensioner assemblies, airbags, interconnecting wiring and power sources. The tire pressure warning light may come on due to natural causes such as natural air leaks or tire inflation pressure changes caused by temperature. In this case, adjusting the tire inflation pressure will turn off the warning light (after a few minutes. The compact spare tire is not equipped with the tire pressure warning valve and transmitter. If a tire goes flat, the tire pressure warning light will not turn off even though the flat tire is replaced with the spare tire. Replace the spare tire with the repaired tire and adjust the proper tire inflation pressure. The tire pressure warning light will turn off after a few minutes. • If tires not equipped with tire pressure warning valves and transmitters are used. • If the ID code on the tire pressure warning valves and transmitters is not registered in the tire pressure warning computer. • If the tire inflation pressure is 73 psi (500 kPa, 5.1 kgf/cm2 or bar) or higher. • If electronic devices or facilities using similar radio wave frequencies are nearby. • If a radio set at similar frequencies is in use in the vehicle. • If a window tint that affects the radio wave signals is installed. • If there is a lot of snow or ice on the vehicle, in particular around the wheels or wheel housings. • If tire chains are used. 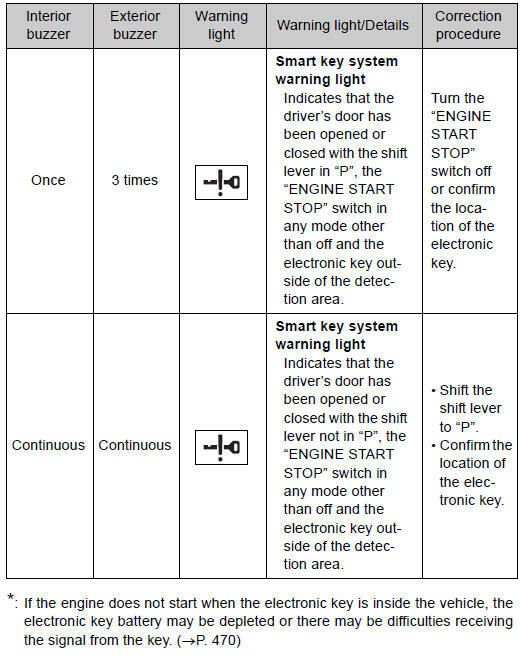 ►Vehicles with smart key system If the tire pressure warning light frequently comes on after blinking for 1 minute when the “ENGINE START STOP” switch is turned to IGNITION ON mode, have it checked by your Toyota dealer. ►Vehicles without smart key system If the tire pressure warning light comes on after blinking 1 minute frequently when the engine switch is turned to the “ON” position, have it checked by your Toyota dealer. • Stop your vehicle in a safe place as soon as possible. Adjust the tire inflation pressure immediately. • If the tire pressure warning light comes on even after tire inflation pressure adjustment, it is probable that you have a flat tire. Check the tires. • Avoid abrupt maneuvering and braking. If the vehicle tires deteriorate, you could lose control of the steering wheel or the brakes.